If you’ve recently been hired in public higher education, you have a very limited time window to make a big decision. Should you choose the Optional Retirement Plan (ORP) or Teacher’s Retirement System (TRS)? You have one chance to get it right. This is an irrevocable decision. Most teachers are automatically enrolled in TRS. However, certain employees of public colleges are eligible to choose the Optional Retirement Plan instead of the TRS pension plan. This is not a decision to be taken lightly! Although both of these accounts are meant to be for retirement savings and income, they each approach this goal using two distinctly different paths. The major difference is that TRS is a defined benefit program and ORP is a defined contribution program. Here’s a quick definition of both. A defined benefit plan specifies the benefit that will be payable to you on a monthly basis when you retire. This amount is based on a formula that includes factors such as years of service and average salary. TRS falls under this category. A defined contribution plan specifies what percentage or dollar amount of your paycheck is withheld and saved in an investment account. In addition to your salary deferrals, your employer will often match your salary up to certain limits. The amount you have in this plan at retirement is not set. It is usually determined by factors such as investment performance and how much you saved in the plan. The ORP falls under this category. To summarize, the TRS plan is set up to provide you a specified income stream in retirement. The ORP is set up to provide you an unspecified lump sum at retirement. How Do You Choose between TRS and ORP? So which is better, a lump sum at retirement or a boring stream of income? It may depend on who is talking. Here’s a warning! You’ve never needed to be more careful of conflicted advice than when making this important decision! The Texas Higher Education Coordinating Board, like most states, takes a hands-off approach to recommending one plan over the other. In their handout “An Overview of TRS and ORP” they suggest you talk to your employee benefits office or your authorized ORP company representative. Let me state this a little more clearly. Your employee benefits office is not going to give you specific advice on choosing a plan. This leaves you with one suggestion for help on this decision – your authorized ORP representative. This “ORP representative” is usually an investment or insurance salesperson. They get paid only if you choose to enroll in ORP instead of TRS. Still expect unbiased advice? You shouldn’t. That statement is problematic for me. Why? First, none of those “significant advantages” are all that significant. Second, most financial services companies like this have gotten really good at changing the retirement equation. 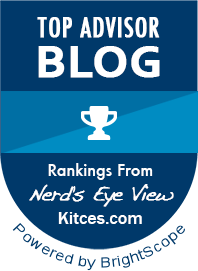 Over time, they’ve used some great marketing to convince individuals that retirement planning should be about accumulating a lump sum amount. The idea is that this lump sum amount will be able to generate an income for retirement. The problem is, it takes a large lump sum to generate the same income you could receive from a pension like TRS. For this reason I usually recommend TRS over ORP. 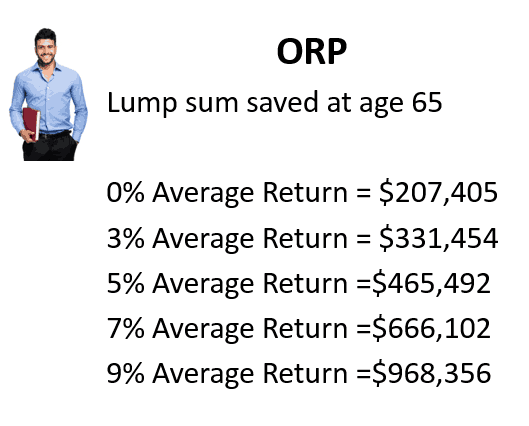 For retirement income purposes I simply can’t make the numbers work in favor of the ORP. Here’s an example of how the math works out. For this story, we’ll use the contribution rates currently used in Texas. Your state may be different, but it’s probably close. Mitch and Katie began teaching at a Texas university on the same day in 2016. They each started with a salary of $45,000 per year. With funding shortfalls, they figured they could only expect an average cost of living increase of 1% per year throughout their career. Both of them planned to work for the next 30 years until they would be age 65. After weighing their options, they each came to a different conclusion about which plan would best fit their retirement needs. Mitch chose the Optional Retirement Plan. Katie’s choice was to participate in the Texas Teacher’s Retirement System. Katie wanted to work and enjoy life. The thought of managing investments did not appeal to her. After running her numbers she calculated that her pension amount would be approximately $40,619 per year. Since she was conservative, she didn’t see how she would ever beat that with an investment portfolio on her own. But Mitch was different. He loved the idea of a little risk and controlling his investment options. His thought was that he should be able to substantially increase his retirement income by managing his own portfolio. He ran a hypothetical future value calculator that showed he could grow his account to nearly a million dollars if he could achieve an average annual return of 9%! It’s hard to argue with nearly a million dollars, but here’s the important question. How much retirement income could he expect if he would have actually averaged a 9% rate of return? It’s not as much as you think. Using this rule, Mitch could expect $38,734 in his first year of retirement. The first thing to notice is that he is not even getting the amount of income that Katie is receiving. It’s also assuming that everything goes right! The fact is, Mitch probably wouldn’t even get that amount of income. The big flaw in the calculation is the same flaw that your ORP company representative will probably repeat. Here it is. You’re not going to get 9%! Sure, the market has averaged that over the past 30 years, but you’re not the market. You’re an investor like me. We have emotions and occasionally make irrational decisions about our investments-usually at the worst possible time. If you don’t believe me, look at this study by Dalbar. They found that the 20 year return for the average mutual fund investor was 5.19% (over the same period the stock market averaged 9.85% annually). Even if you’re more disciplined than the average investor, you still have to consider the performance drag from investment and management fees. If you are using annuity products, which are really popular in these plans, these fees can get really high! I’ve seen them as much as 3% per year. So what can you expect as an annual rate of return if you choose the ORP? Personally, I wouldn’t project much more than a 5% average annual return. 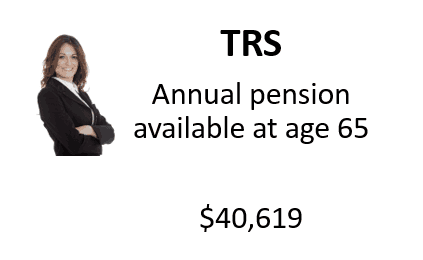 While that would still leave you with a substantial $465,492 at retirement, it simply could not safely produce the same amount of income as the teacher’s retirement pension. In fact, your income would be cut in half! Using the same “4% rule,” you could only generate approximately $18,619 in annual income. That’s a long way from the $40,619 that Katie would be receiving. If you’re in the middle of choosing between ORP and TRS, get ready for some confusion. You’ll likely hear a lot about the benefits of choosing ORP over TRS. Just keep in mind that this advice is usually not objective. Don’t be swayed into something that you can’t undo. There’s a lot riding on you getting good answers to your Social Security questions. The amount of benefits you, or your survivor, will receive can often hinge on how much you know! So don’t let this complicated system get the best of you. If you search in long enough, you should find get the help you need. But if you can’t…I can help. In addition to the articles on this site, I offer two services to help you with your Social Security questions. The first is my Q&A page. On this page you can post your question for free. The other service is my one on one consultation. You can read more about that on the Need Help page.